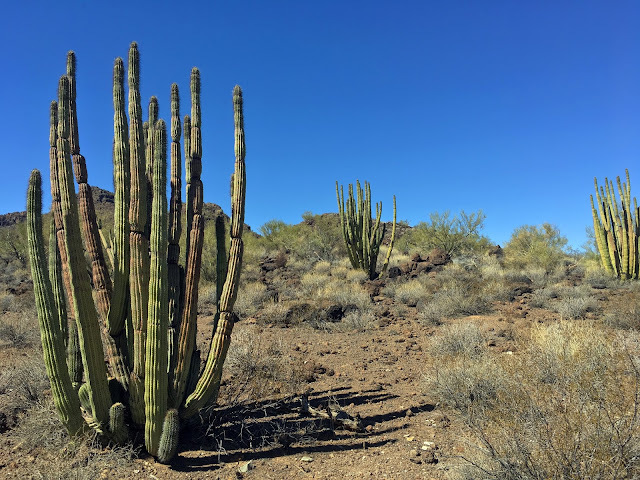 The Organ Pipe Cactus National Monument share 31 miles of international border with Mexico. It's located on AZ-85, the state highway that runs between Why, Arizona and Puerto Peñasco, Mexico. On our way through, we stopped at the visitor's center to gather some information and drive through some of the park to take a few pictures. The organ pipe is a large cactus rarely found in the United States, although it is common in Mexico. The monument protects the bulk of its US range. Like its fellow cacti and other desert inhabitants, the organ pipe is attuned to rhythms of the sun and infrequent rains. A glutton for heat and light, it grows on warmer slopes where it can absorb the most sun. This is critical in winter months when severe frosts can kill the cactus. It blooms in the heat of May, June, and July, opening lavender-white flowers after the sun sets. Organ Pipe Cactus can live to over 150 years of age, and will only produce their first flower near the age of 35.